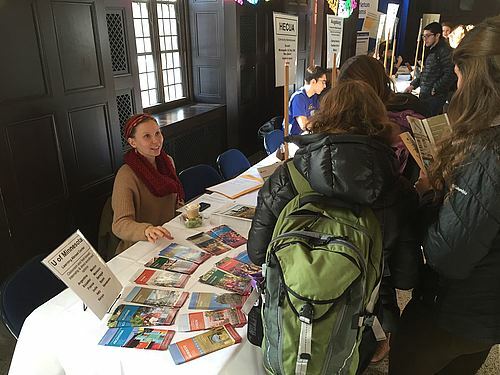 “I think that abroad programs are very important to the Carleton experience. They provide a glimpse into a world unlike our own and help shape the well-rounded liberal arts student that is a Carl." Come learn about hundreds of off-campus study programs available to Carleton students from the experts: students and faculty who have participated in and led these amazing programs. Pick up brochures, ask questions, and discover opportunities. Soup and bread, brownies, and a selection of candies from around the world will be served. Recruiting Returned Students to Volunteer!!! Your expertise is at the heart of the fair; please volunteer if you are able. Super easy, right? And super fun! Sign up today. Please contact Naomi Ziegler (nziegler@carleton.edu, 507-222-4031, Leighton 120).